This post is the second part of the types of organisms found (Aug. 1976) on the extreme western limit of a coastal sabkha along the west side of the northern Gulf of California, in Baja California, Mexico. Part 1 concerned the location of the sabkha, as well as images of mostly terrestrial lifeforms and swimming crabs. Part 2 concerns the mollusks found in a 20-m wide band of drift material restricted to the strand line. Bivalves were extremely common and consisted only of single valves, many of which were unbroken. 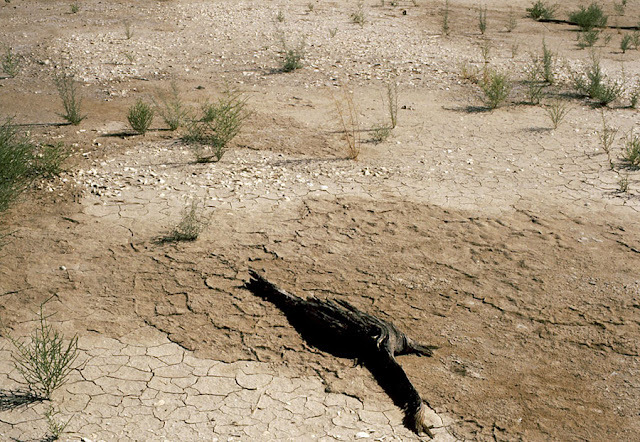 Some of the valves occurred in localized concentrations, whereas others were broken and scattered across the mud-cracked surface. Isolated large fragments of wood (as shown above) were also present. Broken bivalves adjacent to mud cracks. The infaunal (burrowing) bivalve Mulinia modesta Carpenter, shown above, was formerly referred to as Mulinia coloradoensis Dall. 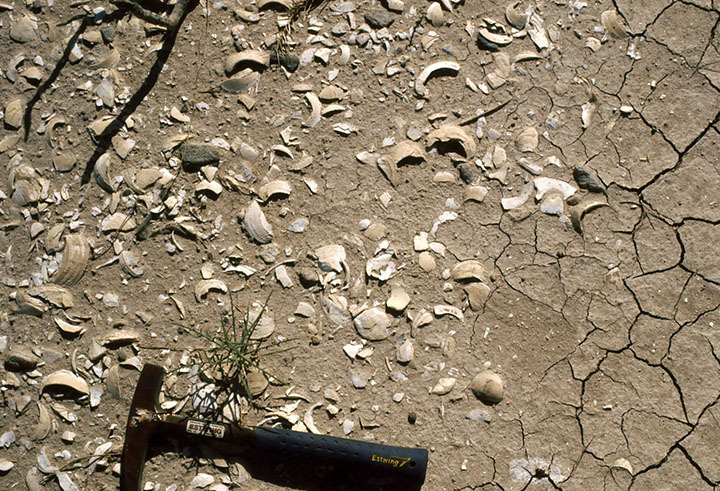 Before the dams across the Colorado River were built, this endemic (found only in this region) bivalve was the most abundant mollusk living on the Colorado Delta. Valves of this species occur in huge numbers in about 10 to 13 km to the east, where they have been subsequently washed out of the tidal flats and now form shelly beaches, beach ridges (= cheniers), and shoals of the delta. At the strand line, there are twice as many right-hand valves and there are left-hand valves. This is evidence of selective sorting by waves. The valves found at the strand line were missing also the outermost perisostracum layer (a horny protective layer) and were bleached. Chionista californiensis? 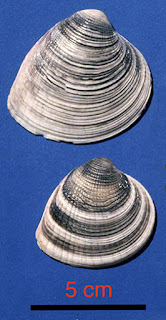 (Broderip) is a common infaunal clam living intertidally on mudflats, as well as offshore. Nassarius howardae? Chace was a moderately common gastropod in the strand-line assemblage. Nassarius gastropods are active scavengers, which burrow horizontally just below the surface of the bottom. 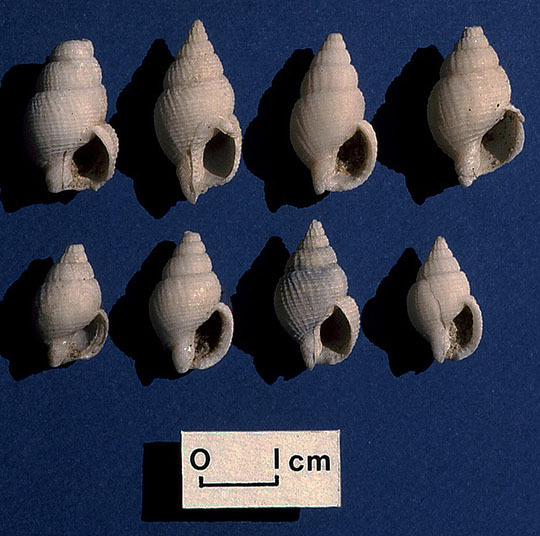 Nassarius gastropods are commonly tidal-flat dwellers. 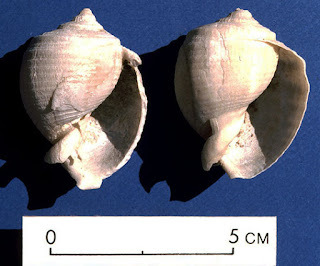 The specimens found at the strand line were slightly worn, and the tips of the shells were commonly missing. Phalium (Semicassis) centiquadrata (Valenciennes) is a gastropod known to live in the sand of very shallow-marine waters. This species was rare (only three found) in the strand-line assemblage. 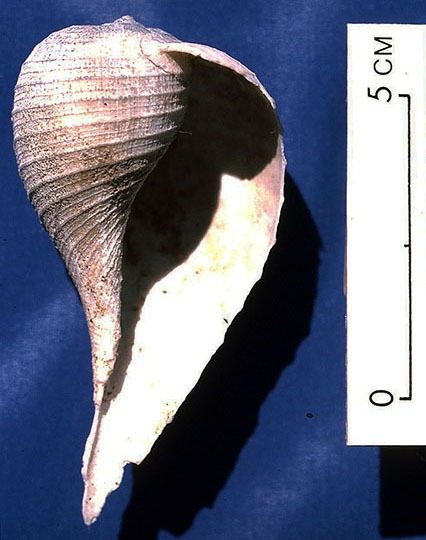 The shells were the following features: protoconch (earliest part of the tip), nodes on the shoulder of the last whorl, outer lip, and some of the more delicate features along the inner side of the aperture (opening of the shell). In general, these shells were considerably worn, and the shell was much thinner than normal. Concerning the taphonomy (what happens after a lifeform dies), the mudflat-dwelling Mulinia and Chione shells, and probably the Nassarius shells, were likely transported reworked a few km and concentrated by the tidal currents and storm waves at the strand line. 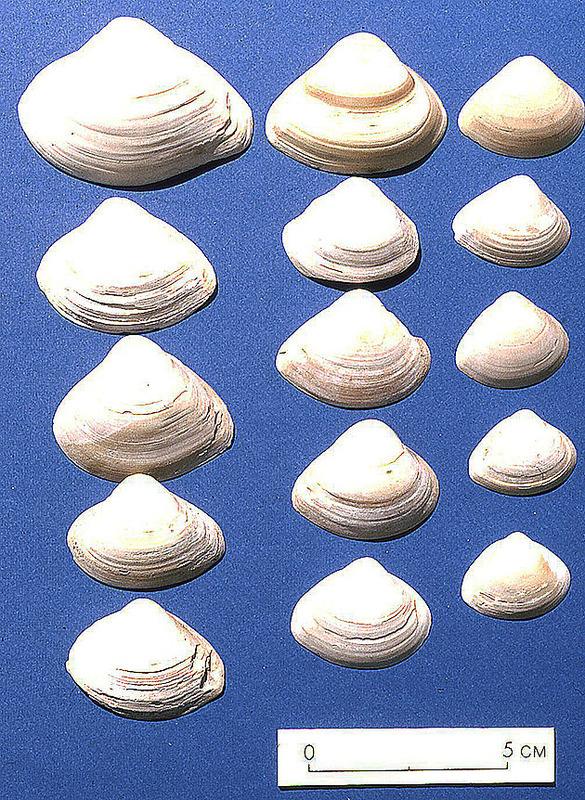 The nearshore-marine shells of Phalium (Semicassis) centiquadrata and Ficus ventricosa were likely transported as much as 10 to 13 km distance by a tidal bore and/or storm waves, which moved across the low-relief sabkha surface. The absence of a barrier-island system in this area allows for unrestricted flooding, which enhances currents capable of transport the remains of marine organisms. Given enough burial and time, strand-line remains will become part of the sequence of coastal tidal-flat sediments consisting of muddy siltstone and claystone, with lenticular beds of gypsum and halite, as well as interfingering lobes of alluvial debris. This sequence has all the characteristics of an arid inland basin, except for the intertidal and marine shells. Normally, one would not expect marine shells to be transported 10 to 13 km (6 to 8 mi.) and to be in such good shape, but the evidence shown above proves otherwise. Mixed assemblages of marine and terrestrial organisms are important in distinguishing between ancient examples of coastal sabkhas and continental sabkhas.